But I am really going to try and improve. This year has been so eventful only two weeks in. Nate and I have replaced the flooring, molding and front door (with much needed help from friends, family and neighbors). Although we still have some work to do before we are finished, there is a light at the end of the tunnel. I admit I have gone a little crazy living in a construction zone, but Nate has done a truly amazing job and the place looks so nice. Marie and I have begun our new business venture. The steps to get a state approval have been lengthy, but we have waded our way through it and are now waiting for state, zoning and fire marshall inspections and the process will be complete. We have a pretty lengthy waiting list of clients and are getting so excited for field trips, story time and of course art projects. Scarlett has been walking like crazy. It seems like one day she just gave up crawling and started plodding all around. She still has a bit of a Frankenstein walk and falls down a million times a day, but she is so happy to be cruising around. Her favorite activity is to carry around a bucket, lunch box or purse in one hand while holding her phone up to her ear chatting away. I am working on catching this on video, I promise! And we got to see the first glimpse of our newest little treasure. I love my new grandbaby. And so cute, just like you. I'm sooooo glad you finally posted something!! Sounds like you guys are crazy busy. 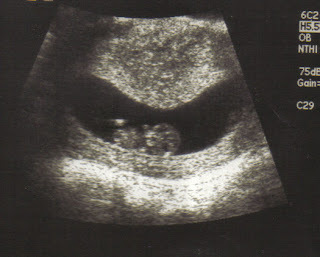 I love the ultrasound pic, yet another beautiful member of the Smith family.